Needlework is a broad term for the handicrafts of decorative sewing and textile arts (Wikipedia). This definition immediately puts me in mind of Jennifer Ladd who makes handmade bags, purses, and baby items in the online shop that bears her namesake - "Jennifer Ladd". A former French teacher turned stay-at-home-mom Jennifer opened her Etsy shop in December 2007. When asked about selling online, Jennifer cheerfully stated, "I am LOVING the experience!" 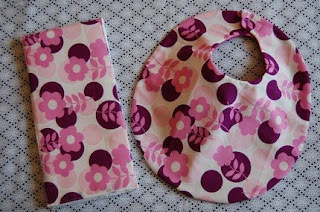 Her handmade bags, purses, and baby items carry a common theme - bright colors and funky patterns. "I strive to pay attention to all the details of my pieces, such as adding cool linings or surprise ribbon accents to the inside pockets." Yet Jennifer admits, "I also love simplicity, sleek lines, and modern design." When asked, "What inspires you?" It was no surprise when Jennifer responded, "pretty colors and pretty patterns." This is evident in the various completed projects - baby booties, purses, bibs, etc. I could not help but laugh when Jennifer went on to say, "when I see beautiful color combinations, my brain does a happy dance." I learned that Jennifer has been sewing for longer than even she can remember. "My mom says I started when I was 3 - I think she's exaggerating!" Amazingly, Jennifer learned to sew by watching her grandmother and then replicating what she did to make clothes for her dolls. Let's just say, I attempted to learn to sew in my 7th grade Home Economics class and have yet to produce anything close to the beauty and perfection of the items found in Jennifer's shop. Speaking from personal experience, Jennifer possesses a natural talent. "My dream job was to run my own business and sell my handmade items." Now that Jennifer is a stay-at-home mom she will have the opportunity to turn a former hobby into a successful business. Although, Jennifer's first love will always be her daughter whom she and her husband adopted last summer from Vietnam. Visit her personal Flickr site at http://www.flickr.com/photos/vietnamladd/ to see this proud mom's bundle of joy. Jennifer's advice to fellow crafters and Etsy Sellers... "Have fun with what you are doing. Don't get so caught up in the sales and the hearts and the money that you stop having fun. We have the best job on earth! Enjoy creating!" Great blog, article and seller! Nice work! Beautiful bags! Nice to learn more about you. beautiful feature! 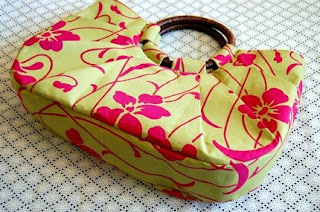 i love the bag, the fabric is lovely! I love the bag, beautiful colors! Thank you so much for featuring my work. You have such a talent at writing, it was wonderful to read your sweet blog post!! Thanks for your words. I'll visit your blog soon. I have to sign off within the next few minutes. I love all the bold prints! nice post--thanks for letting us know about other cool crafters! Nice feature. Great artist with so much talent! She does amazing work. Your features are really nice! I love your last paragraph....the etsy shop, blogging, flickr, stumble upon...it all becomes overwhelming. We all need a reminder of why we do what we do! I am very glad to have had the opportunity to bring Jennifer Ladd to your attention. Thanks for visiting. I hope to bring you more great articles and features in the future.